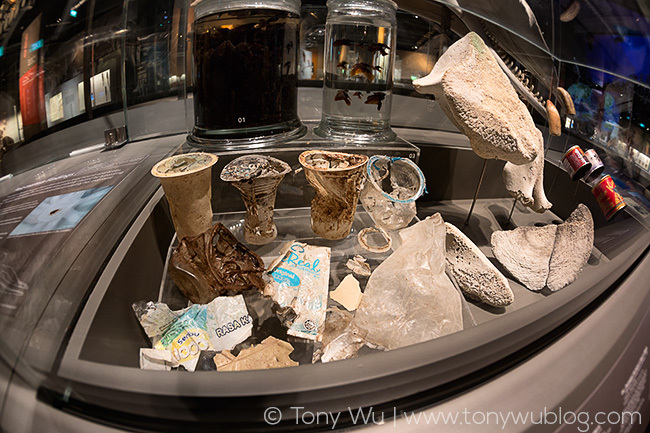 During a recent layover in Singapore, I had a chance to drop by the new Lee Kong Chian Natural History Museum, where my friends Swee Hee and Heok Hui were kind enough to show me around. There is a lot of interesting stuff. I geeked out many times. In fact, I got so excited about the fungus exhibit on one occasion that I think I made Swee Hee nervous. Oops. The highlight of my visit, of course, was seeing Jubilee, the skeleton of a 10.6m female sperm whale (Physeter macrocephalus) that was found floating near Jurong Island in July 2015. 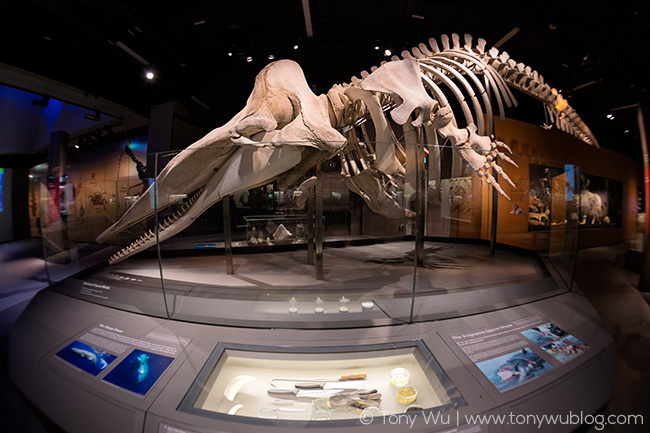 The death of a whale is always sad, but at least in this instance, there is a chance for everyone to see the skeleton and perhaps learn a bit about the biology of these magnificent animals, as well as the threats they face. Threats? What threats could such a large animal possibly face? Well, she was found with a large wound in her caudal area (that's the rear end), one that was consistent with an injury resulting from a run-in with a ship. The illuminated part of the tail that's visible in the photo above shows where the injury was. I'm not sure whether it was possible to determine that a collision was the cause of death, but ship strikes happen often enough to whales around the world that it's a big problem. Plastics, plastics, plastics. Poisoning and murdering marine life everywhere. In the grand scheme of things, the amount of plastic found in her stomach wasn't a lot. Other dead whales have been found with much, much more. But given that Jubilee was only 10.6m, she may not have been fully grown, meaning that had she survived, she would likely have ingested yet more plastic as the years passed. So if you live in Singapore or are passing through, visit the museum. Learn about some of the amazing fauna and flora of Southeast Asia, and spend some time with Jubilee. Read about her story, about her injury, about her death. Look at the jar filled with squid beaks taken from her gut. Stare at the plastics and contemplate the havoc that the byproducts of our daily lives wreak on marine life.